Add this creamy, crunchy side dish to your menu this year. The Perfect Bite Co. dreamed it up just for us. 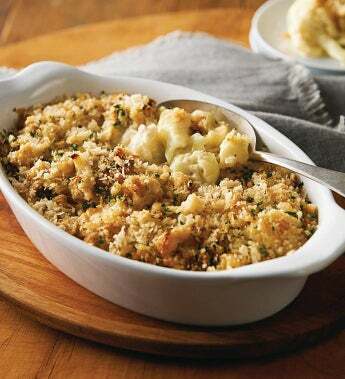 Everyone will enjoy roasted cauliflower drenched in a rich, creamy blend of parmesan and Gruyère cheese topped with a crunchy, herbed breadcrumb mixture. This dish arrives frozen on its own cooking sheet, ready to heat and serve.